We all know that smoking cigarette is horribly destructive and in many cases, deadly, killing half of all people who don't quit. Over 7000 chemicals have been identified in cigarettes and cigarette smoke to date, 93 of which are harmful or potentially harmful, and more than 70 of which can cause cancer. These ingredients and additives affect everything from the internal functioning of your organs to the efficiency of your body's immune system. Some of the facts and statistics about smoking may surprise you. Nicotine reaches the brain in 7 to 10 seconds after smoke is inhaled. Nicotine has been found in every part of a smoker's body, including breast milk. It's also as addictive as heroin. Carbon monoxide, which is present in cigarette smoke, binds to hemoglobin in red blood cells, preventing these cells from carrying all of the oxygen they normally would. This can lead to symptoms of carbon monoxide poisoning. Cancer-causing agents (carcinogens) in tobacco smoke damage important genes that control the growth of cells, causing them to grow abnormally or to reproduce too rapidly. More than 70 such cancer-causing chemicals have been identified in cigarette smoke to date. Smoking affects how the immune system functions by causing oxidative stress. This, in turn, causes DNA mutation, setting the stage for cancer and heart disease. Oxidative stress is also thought to be a contributor to the aging process. Antioxidants are nature's way of combating the damage oxidative stress causes to the body's cells. Smokers have fewer antioxidants in their blood than non-smokers. Smoking is associated with higher levels of chronic inflammation, another damaging process that may result in oxidative stress. Cigarette smoke contains radioactive heavy metals that "stick" to the tar that collects in the lungs of smokers. Over time, this builds up and is believed to be one of the risk factors for lung cancer in smokers. 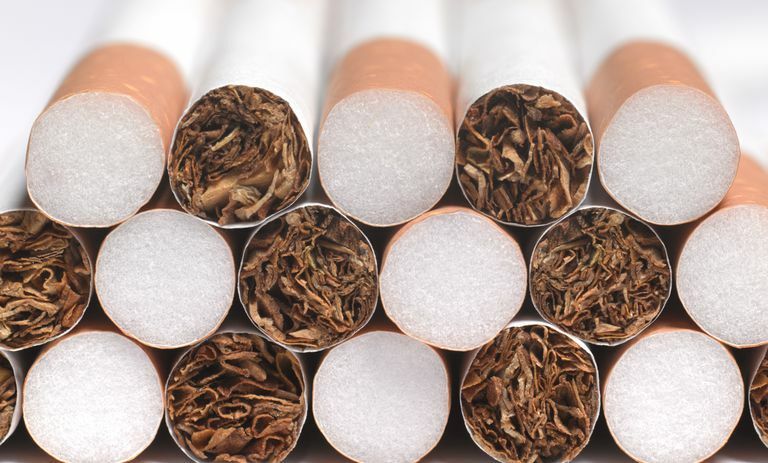 In the United States, cigarette smoking accounts for approximately 480,000 deaths a year. Globally, nearly 6 million die from tobacco use annually, and if current trends continue, that number is expected to increase to 8 million by the year 2030. If no one smoked, cancer deaths in the U.S. would decrease by one-third. Lung cancer is largely a smoker's disease; 90% of men and 80% of women who succumb to lung cancer smoked. COPD-related deaths are also primarily caused by smoking, with 90% of these deaths traced back to cigarettes. Smokers die 10 years sooner than non-smokers, on average. More than 41,000 die per year from exposure to secondhand smoke. Tobacco use is responsible for more deaths each year in the U.S. than all of the following combined: Human immunodeficiency virus (HIV), motor vehicle injuries, alcohol use, and illegal drug use. Centers for Disease Control and Prevention (CDC). Health Effects of Cigarette Smoking. Updated May 15, 2017. Centers for Disease Control and Prevention (CDC). Cigarette Smoking and Radiation. Updated December 7, 2015. Centers for Disease Control and Prevention (CDC). Smoking and Tobacco Use: Fast Facts. Updated November 16, 2017. U.S. Food and Drug Administration (FDA). Tobacco Products: Cigarettes. Updated July 31, 2017.